Nutrition bars are a dime-a-dozen today. There’s high-carb, low-carb, gluten-free, high protein, high fat, and designer low-cal bars (like Atkins or Weight Watchers). Unfortunately, the vast majority of these bars taste like cardboard and just leave you with a rather empty feeling both in your wallet and stomach. Oh Yeah! ONE Bars are the next wave of high quality protein bars that will fill you up without filling you out. But it’s the lemon cake flavor that’s to die for! Over the past few years, Quest Nutrition set themselves apart with high quality bars that both filled you up, tasted great (for the most part), and provided loads of nutrition and muscle-building protein. ISS Research has taken the baton from Quest and run ahead of the pack with their Oh Yeah! ONE Bars. We’ve always known OhYeah! to make some fantastic-tasting protein bars. The thing is, their standard protein bars are more like candy bars with added protein. That’s great for taste, but not so great for macronutrient-cautious dieters. OhYeah! ONE Bars change all of that, blending the incredible macros of something like a Quest Bar with the ridiculous taste of an OhYeah! Bar… so far surpassing Quest on a few fronts, in our honest opinions. Long story short? You have GOT to try the Lemon Cake flavor! The specific calories for each bar will vary by flavor but they all reside within the 210-220 calorie range. Not too many or too few calories, whether you’re cutting or bulking, these will fit nicely into your caloric budget. OhYeah! 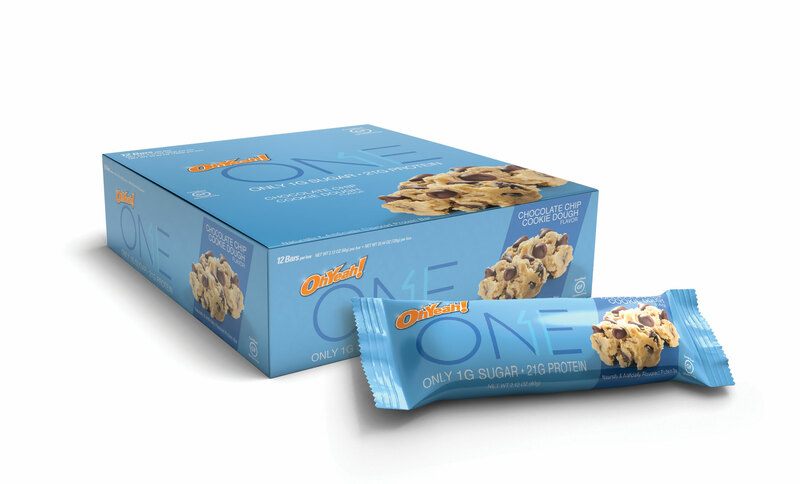 ONE Bars pack over 20g of protein in each bar all with only 1g of sugar! Whey protein is typically seen in protein powders in the form of concentrate, isolate, or hydrolysate. Isolate is generally over >90% protein with almost no traces of lactose, carbs or fats. It is an ideal fit for those that previously turned away from whey products due to digestive issues experienced to lower quality whey protein concentrates that are often included in protein blends. Milk Protein contain both whey and casein proteins, which gives it a digestion rate trade somewhere between the rapid rate of whey and the slow-release rate of casein. It consists mainly of casein though, so this may help lend a richer tasting texture to the ONE bars. This ingredient may or may not be familiar to you, but it’s the exact same stuff that comes in the rather popular Vita-Fiber™ syrups frequently used in low sugar recipes. Isomalto-oligosaccharides (IMOs) are a mixture of short-chain carbohydrates which have digestion-resistant properties, meaning your body has a difficult time breaking it down and absorbing any of the calories or nutrients it contains. IMOs were first made popular as the fiber-based sweet-tasting carb source in Quest Bars, and they’re more and more commonly used in these next-generation protein bars. ONE Bars use a variety of sweeteners and sugar alcohols to keep fiber high and sugar low! The greatest benefit to using IMO in bars like ONE bars are that they sweeten the bars without jacking up the sugar amount. They DO, however, contribute tons of digestible fiber, further helping modulate blood sugar levels and enhancing GI system functioning. One word of warning though is that excess consumption of IMOs can lead to some rather unpleasant bloating, cramping, and other stomach related maladies when consumed in excess of 40g/day. It’s advised to limit intake to around 30g/day. Maltitol is a type of sugar alcohol that’s typically used as a sugar replacement. It has about 75-90% the sweetness of sucrose yet adds half the caloric damage of regular table sugar. Similar to IMO it doesn’t promote dental caries and is found in a wide range of products from chewing gum to hard candies to sugar-free chocolate. As is the case with other sugar alcohols, there is the infamous “cooling sensation” that some experience when consuming products with various sugar alcohols included in them. Rounding out the last major sweetener used in ONE Bars (there is some trace sucralose used), is glycerine. The is another sugar alcohol that is colorless, odorless, and widely used in the food industry. It carries 27 calories per teaspoon (compared to 20 for table sugar), and is 40-60% as sweet as sucrose. 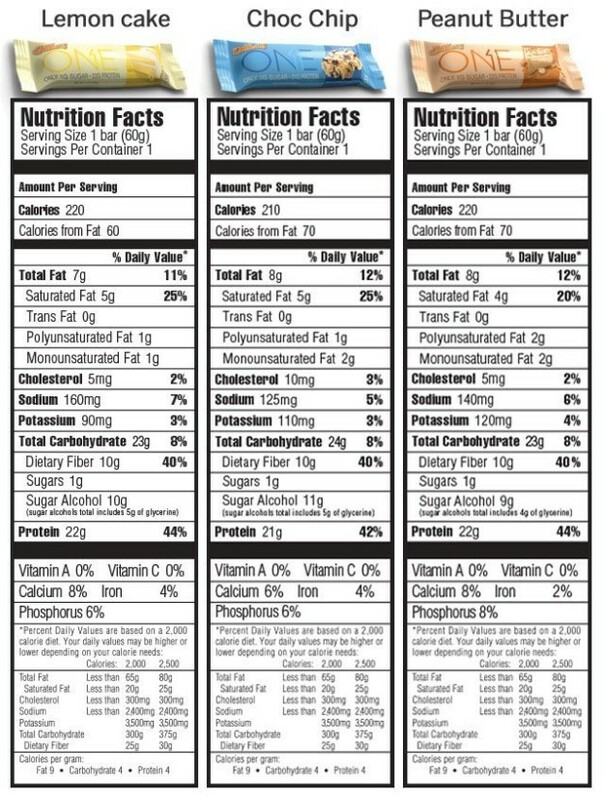 Although it does carry a similar caloric density to sucrose, it does have a lower glycemic index, so it won’t send you blood sugar levels through the roof or bottom you out like traditional candy bars sweetened with sugar or high-fructose corn syrup would. One bite of these ONE Bars will have you screaming OhYEAH!!!! Variety Packs are also available! OhYeah! ONE Bars provide yet another delicious option for those that need a protein-packed treat on the go when they don’t have the time to sit down for a full on meal or want to make a protein shake. We honestly believe that the Lemon Cake bar is better than anything Quest Nutrition has ever offered – both in taste and texture. This is quite easily the Next Big Thing™. With five different flavors to choose from, you can keep a few flavors around between home, office, and the car to keep your palate from getting fatigued of the same old “chocolate peanut butter” flavor that so many other nutrition bars use. Stay tuned to PricePlow for more updates where to get the best deal on these delicious tasting protein goodies! No Comments | Posted in New Products, Supplement News | Tagged Glycerin, Isomalto-Oligosaccharides, ISS Research, Maltitol, Milk Protein Isolate, Protein, Protein Bars, Quest Nutrition, Vita-Fiber, Whey Protein Isolate.